A week or so ago we invited a few friends over to celebrate Allen's 50th birthday. I planned the food, I planned the beverages, I planned the entertainment. 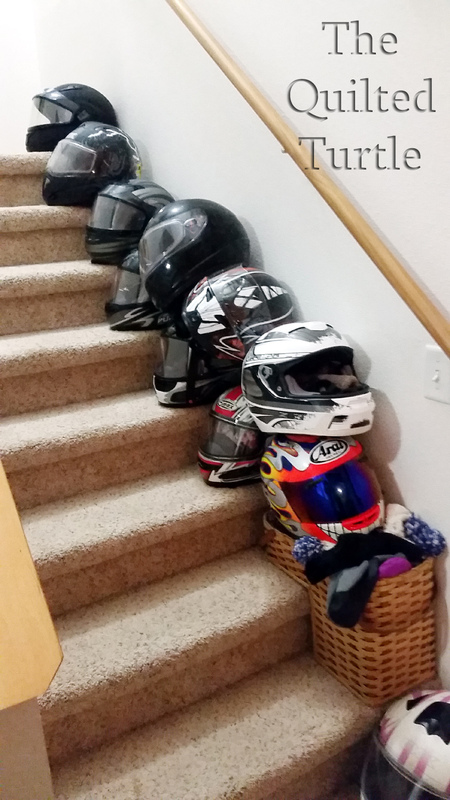 However, I forgot to think about where I could stash all the snowmobile helmets. It really surprised me - I am a total planner and I don't usually forget details like that. Plus, this is my 25th Mackinac winter, so you'd think I would have encountered this before. Apparently not. My takeaway from the evening - we really need to have people over more often! Not something I would have thought to plan on...great photo! Didn’t need to worry about helmets until less than 10 years ago! But I like your solution. Out here on the opposite coast it is rain gear in the winter that we run out of spaces for, especially on wet nights!